It was February 2010 when then Stowers Principal Mrs. Eileen Bladgen reported a threat on the lives of two of her teachers by a third teacher to the sheriff. Under the law Mrs. Bladgen is obligated to report any such incident to law enforcement. Her superiors and AFT President Laura Rico told her they would take care of the matter and she didn’t have to do anything more about the incident. The District then reacted to her sheriff’s report by placing her on administrative leave for the rest of the school year, demoting her to a teaching position, and worst of all using false evidence of her incompetence to justify its action. Last month Superior Court Judge Joanne O’Donnell in Los Angeles ruled the evidence used against Mrs. Blagden to demote her was fabricated. The case now goes to a Settlement Conference on July 17. 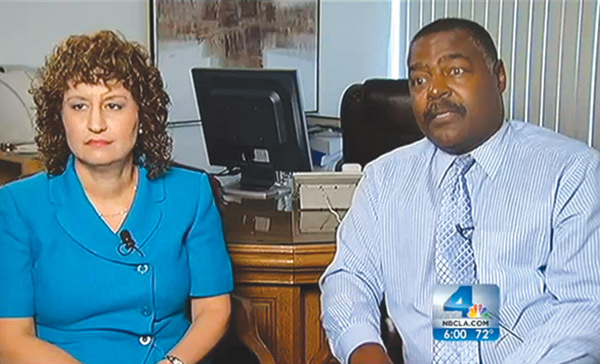 PHOTO COURTESY OF NBC NEWS Former Stowers Magnet School Principal, Eileen Blagden, shown here with her attorney Ron Wilson, is suing the ABC Unified School District because she claims she was demoted for reporting death threats being made against two teachers. However, the school district maintains they demoted Blagden as a result of her performance. The events leading up to Blagden’s leave of absence and subsequent demotion occurred when a teacher, Kevin Kirby, arrived at Stowers on Jan. 25, 2010 at approximately 9 am with bloodstains on his clothes and told a secretary he had been in an accident on the freeway while riding his motorcycle. Blagden told Kirby he should not report to his classroom due to his appearance and possible injuries. Kirby told her he refused medical treatment at the scene of the accident and didn’t need a doctor. Blagden’s attorney Ron Wilson said former Superintendent Gary Smuts stated the day before the “Kirby incident” that he had decided to demote her and made that announcement at a cabinet meeting. Unfortunately there is no documentation of the meeting. According to Dr. Smuts the accusation was not true. Wilson said the District hired a coach for Mrs. Blagden to improve her standing. According to the coach her biggest job was to determine why she was there or what Mrs. Blagden’s deficiencies were. “No one ever told me,” she testified under oath. “No one ever talked to her.” Wilson said. In her deposition then Deputy Superintendent Dr. Mary Sieu testified that Stowers was a great school. She said she didn’t know if it was a good thing that Mrs. Blagden reported the death threats to the Los Angles County Sheriff Department. She confirmed Assistant Superintendent Carol Hansen had told Mrs. Blagden to do nothing about the death threats. Dr Sieu also described Mrs. Blagden as an honest person. She said she was told by Dr.Smuts that Mrs. Blagden was placed on administrative leave because of the death threat incident. She also said Carol Hanson told her the same thing. Dr. Sieu testified one of the reasons Mrs. Blagden was disciplined and demoted was for divulging con-fidential information. Asked what the information was, she replied the reporting the death threat made by teacher Kevin Kirby against two other teachers to law enforcement officials. Another issue used against Mrs. Blagden was she refused to support an illegal, school sponsored non-profit foundation, which was not properly set up in accordance with California law. The ONLY advocate for Teachers and Students that OPPOSED the ABC Corruption and WORKED HARD to protect the RIGHTS OF STUDENTS, TEACHERS AND PARENTS was former ABC 2o year Board Veteran Cecy Groom!! REMEMBER, it was Cecy that first exposed this and other corrupt practices of the ABC District. For her hard work and decency Cecy was shunned and stabbed in the back by the pack of FOOLS on the ABC Board and the Superintendent, Smuts and the current puppet Mary Sewer! Thank you very much for your kind recognition of Cecy Groom whoever you are. I did it for the true meaning of public service for which elected officials supposedly bound to do. But once some us get there, it becomes self service. It would seem to me anyone including the superintendent and anyone else that supported these wrongful acts that would perform down to the level where they intended to inhibit or punish anyone that had the best interests of the school and was following common sense and the law lacks the integrity and professionalism needed fulfill the duties and responsibilities of the ABC board. If those individuals do not remove themselves, it only shows they only have their own selfish interests in mind, not the district, the kids nor the staff. What a bunch of idiots, there is so much more behind the scenes in this DRAMA—-SMUTS should get a job with the city of Norwalk, they like to cover up for child molestation coaches. He should try for the Parks and Recreation Department.